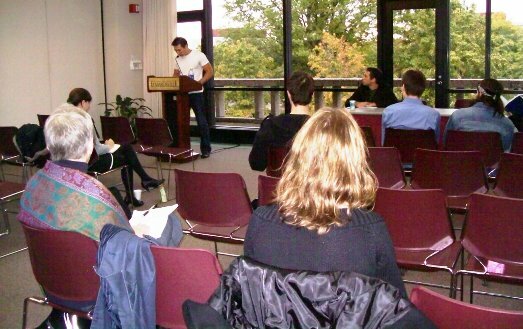 Above, Adam M. Croom of the University of Pennsylvania reads from his paper "Racial Epithets: What We Say and Mean by Them" at the 3rd Annual Undergraduate Philosophy Conference at SIUE in October 2008. They came from colleges and universities across the United States, institutions of higher learning with hallowed halls, institutions such as Cornell, the University of Pennsylvania, Reed College, DePaul University, Penn State. Geographically, they came from near and far: New Mexico, North Carolina, Washington DC, Minnesota, Texas, Massachusetts and Alabama. Fairly soon it becomes evident that this might be a gathering of some import. This indeed was the case, as the Third Annual Undergraduate Philosophy Conference took place at SIUE Oct. 24 and 25, 2008. A core group of about 40 attendees included philosophy students and faculty, as well as a few history majors and other interested SIUE students. Presentation topics varied from racial epithets and magic realism to works by Karl Marx, Thomas Nagel and Plato. This type of representation from students and institutions across the United States is a sign of how much the conference has grown in only three years. At the first conference in 2006, a dozen student papers were selected for presentation. For this year's event, 23 out of 37 submissions were selected. Assistant professor in Philosophy Dr. Lucian Stone serves as faculty sponsor for the conference. He knows why attendance at this conference continues to increase. "Although there are several conferences for philosophy students, most of them are only for graduate students," he said. "In fact, there are only a handful of conferences that are specifically for undergraduate students. So undergraduate students really do not have many opportunities to present their work," he concluded. Stone explained that SIUE's first undergraduate philosophy conference began after student Kyla Sweeney returned energized from presenting her paper at a similar conference in 2006. "When she returned after having such a rewarding experience, she asked, 'Why can't we host a conference here?' " he recalled. "And thus began the conference, a grassroots effort. In short, she and I understood the value of meeting and exchanging ideas with our peers and thought it would help promote philosophy at SIUE." Sweeney served as the first student organizer for the 2006 SIUE Undergraduate Philosophy Conference. The 52nd Annual Conference of the Illinois Archaeological Society, hosted by SIUE's Anthropology Department and Cahokia Mounds State Historic District, on Sept. 19-21, 2008. Nearly 100 professional archaeologists, anthropology students and avocational archaeologists were in attendance for the weekend of paper presentations, discussion and banquet. The 101st Meeting of the Illinois State Academy of Sciences will be sponsored by SIUE's Biological Sciences Department at the Morris University Center on April 17 and 18, 2009. More than 300 faculty, undergraduate and graduate students are expected to attend this regional conference, organized by various Illinois colleges and universities. The American Weil Society's 29th Annual Colloquy will take place at SIUE April 25 and 26, 2009. The event will be sponsored by the American Weil Society and SIUE's Philosophy Department. This free international conference features presentations by university faculty, graduate students and one undergraduate student in philosophy. This event hopes to see 25 to 50 attendees, including SIUE faculty, staff, students, and members of local and distant communities. This opportunity to be engaged as a scholar in the field of philosophy remains first and foremost at SIUE's conference. For example, students had an opportunity to go out to dinner with keynote speaker Dr. Susan Bordo on Saturday evening. A noted author on feminism, body image and contemporary culture, Bordo is a professor of English and Gender and Women's Studies at the University of Kentucky, and holds the Otis. A. Singletary Chair in the Humanities there. Her keynote speech entitled "Beyond Eating Disorders" on Saturday evening drew the largest audience of the event, with around 250 people in attendance. Mindy Young Lawson served as the student organizer for the 2008 conference. She explained that although things ran relatively smoothly, there was a great deal of legwork that went into planning the two-day affair. "The planning of the event took approximately one year," she said. The first step in January 2008 was to contact keynote speaker Susan Bordo and get her scheduled. Then began the long process of soliciting student proposals. "To get the word out, I basically went online and looked up colleges state by state and found the department chairs for the philosophy department, and women's studies, history, English, and psychology and sent out the call for papers. I did this twice--once in March and once in September." Papers were then peer-reviewed by members of the SIUE Phi Sigma Tau philosophy honor society. The selection committee considers whether the papers are well written and pose interesting questions and possible solutions using philosophical resources. Stone said the committee also understands the conference is aimed at undergraduate students. "The emphasis for selecting papers is not placed on 'correct' interpretations," he said, "but rather on an earnest grappling with complex philosophical ideas." Young-Lawson had much success with raising funds to support the conference. She was able to gather nearly $8,000, with nearly half coming from sponsorship by the Delta Phi Epsilon sorority. Several offices across the University also contributed to the cause, including the College of Arts and Sciences, the Office of the Provost, the Vice Chancellor for Student Affairs, the Graduate School and the Philosophy Department. This strong financial support translated into savings for those at the conference, since no registration fee was required. All students in attendance also received a complimentary copy of Susan Bordo's book "Unbearable Weight," which were purchased with solicited funding . For Young-Lawson, the conference fulfilled its purpose for her as both an organizer and as a participant. "Overall, I am very pleased with the success of the event," she said. "I viewed it as successful when numerous participants approached me after and voiced how much they appreciated such an event, as well as how much fun they had." She also benefited from the experience on a personal level. "This was truly a wonderful and engaging experience for me to partake in. I met some great people, listened to some wonderful papers, held great and intellectually engaging conversations with fellow students, and actually learned quite a bit about philosophy and about myself." The Fourth Annual SIUE Undergraduate Philosophy Conference will take place Sept. 25-26, 2009, with Dr. Eduardo Mendieta of Stony Brook University serving as the keynote presenter. For more information, visit http://www.siue.edu/artsandsciences/philosophy/upc/fourthannual_upc.shtml.